Brookton Speedway came about because of the Claremont Speedway group who led by Aub Lawson tried a bold venture by promoting a number of Speedway meetings on the Brookton oval in 1968. The first of only a few meetings was held on the 20th of October 1968, It had been advertised in the Claremont Speedway programme on the Friday night and boasted an aray of Claremont competitors as the main attraction for the event. The programme featured Solos, Sidecars, Speedcars, Supermodifieds and Production Sedans. Riders and drivers who competed at the Brookton Speedway were Chum Taylor, Jim Phillips, Kevin Russell, on the bikes. Bill Richards, Stan McEntee and Wally Cowie in the tq division. Speedcars were headlined by Geoff Stanton, Bill Jost, John Fenton and Laurie Mathews. Bill Sullivan and Alan Wroot headed the Supermodifieds along with Laurie Hillary, Neville Outram, Johnny Sims and Noel Weston. No safety fence was ever erected around the local oval, the outer boundaries of the track were marked out with hay bales around the perimeter. Bill Richards recalled: I raced there but can only remember Wally Cowie had just purchased the ex Charlie West tq and had a nasty accident when he hit one of the hay bales. Gary Sharpe recalls: I remember the race meeting well as Dad and myself both raced on the same day. One particular meeting in 1987 the Claremont promotion team held a meeting as a fundraiser for the Meckering Earthquake. 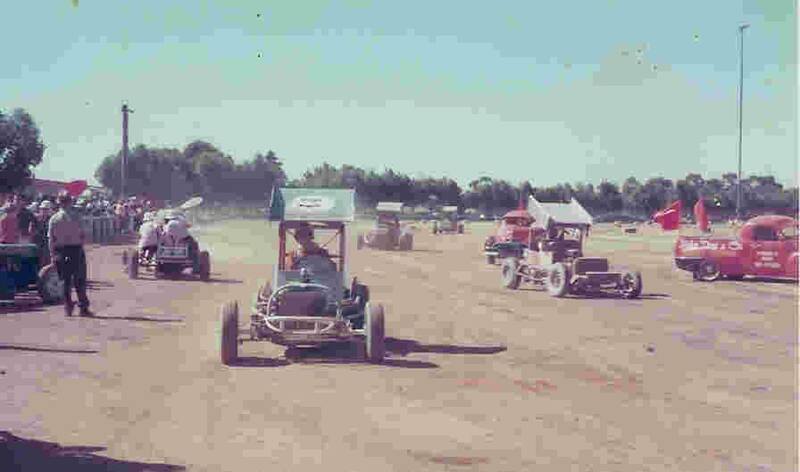 1968 - Brookton Speedway Supermodified action with assistance from the John Day utes. The race track was around the outside of the Brookton Showgrounds, The venue now hosts the annual Brookton Old Time Motor Show.